Data were collected in the logging concession at the Fazenda Rohsamar in the municipality of Juruena in northwestern Mato Grosso. Estimates of damage associated with logging operations were made after logging operations were complete in 2003 and 2004. Damage associated with gaps created by felling single trees was estimated in 54 individual gaps. Characteristics of the single harvested tree were recorded and included species, DBH, commercial height, total height, and canopy proportions. Damage to all surrounding trees was recorded. Stratified transects in two logging blocks were used to estimate damage associated with road building and skid trails. Twenty-six transects were established in Block 5 and 21 transects in Block 18 to assess the frequency of damage by log skidders and tree felling. The boundaries between different types of damage were noted along the transect and the length in meters of that damage type along the transect was recorded. From this information, the area of the logging block affected by tree felling, road building, and skid trails was estimated. The Gap Survey and the Logging Damage Transects Survey data are provided in comma-separated ASCII files. A third file provides the coordinates of the starting points for the Survey Transects. Figure 2. Commercial timber inventory (dark points) and scientific transect waypoints (yellow points) for Block 5, super-imposed on the topographic index (derived from 30-m ASTER DEM; identifies areas of landscape with similar hydrology. Darker tones represent convergence zones, whereas the lighter areas are well drained. This data set was archived in May of 2010. Users who download the data between May 2010 and April 2015 must comply with the LBA Data and Publication Policy. 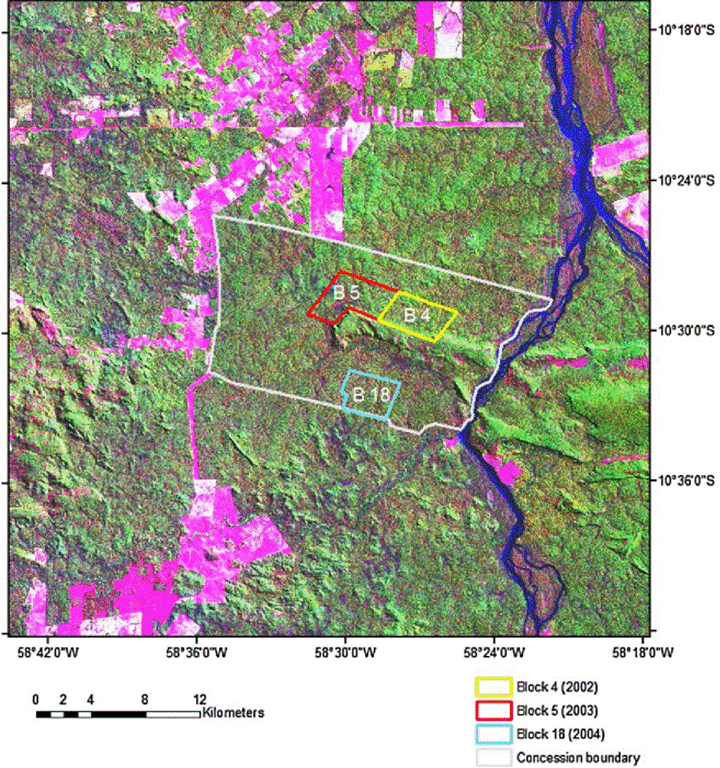 These data were collected in the logging concession at the Fazenda Rohsamar in the municipality of Juruena in northwestern Mato Grosso. Estimates of damage associated with logging operations were made after logging operations were complete in 2003 and 2004. Damage associated with gaps created by felling single trees was estimated in 54 individual gaps. Characteristics of the single harvested tree were recorded and included species, DBH, commercial height, total height, and canopy proportions. Damage to all surrounding trees was recorded. Stratified transects in two logging blocks were used to estimate damage associated with road building and skid trails. Twenty-six transects were established in Block 5 and 21 transects in Block 18 to assess the frequency of damage by log skidders and tree felling. The boundaries between different types of damage were noted along the transect and the length in meters of that damage type along the transect was recorded. From this information, the area of the logging block affected by tree felling, road building, and skid trails was estimated. Data were collected in logging concession at the Fazenda Rohsamar in the municipality of Juruena in northwestern Mato Grosso. Estimates of damage associated with logging operations were made after logging operations were complete in 2003 and 2004. Damage associated with gaps created by felling single trees was estimated in 54 individual gaps. Stratified transects in two logging blocks were used to estimate damage associated with road building and skid trails. 8 Total_gap_area m2 Gap area was measured using the center point system (Runkle 1982) based on the summation of the area of six triangles using the distance from the center of the gap to the edge to define the triangles. 1 Sample_date YYYY/MM/DD Sample date. 5 Transect_total meters Total length of transect. Value repeated for each Damage observation on that Transect. 7 Landscape_position Transect sections (25 m) were assigned to one of three topographic positions (upland, lowland, or slope) based on estimates of hardwood (upland) vs. palms (lowland), slope, and proximity to streams. 8 Damage_class Category of ground damage: gap, none, road, or skid. from the origin of the Transect and sum to the Transect_total length. always related to an area of ground damage. Zeros represent zero canopy damage within Damage_class. The data set covers the period 2003/09/30 to 2005/07/06. The methods developed in this study could be useful for facilitating commercial inventory practices, understanding the relationship of tree species distribution to landscape features, and improving the novel use of commercial timber inventories to estimate above ground biomass. In this example, along a 261.5 m transect, at various point along the transect either ground disturbance or canopy disturbance was noted. For example, after 91.1 m of no ground damage, then 7.6 m of gap ground damage, and within that area of gap ground damage, there was 9 m of canopy opening (linear). The meters of "ground damage"sum to the total transect length of 261.5 m.
Sampling was stratified to provide full coverage of each logging block. Within a stratified area the transect start point was randomly selected. Twenty-six transects were established in Block 5 and 21 transects in Block 18 to assess the frequency of damage by log skidders and tree felling. Distance along the transect for each type of damage was recorded. Transect sections (25 m) were assigned to one of three topographic positions (upland, lowland, or slope) based on estimates of hardwood vs. palms, slope, and proximity to streams. Road and deck locations in Blocks 5 and 18 were mapped with a GPS. Road width was measured at 11 random points and deck size was measured at 10 decks (representing 11% of the total). Total length and area in roads were calculated and maps produced using GIS (Figure 3). To quantify the effects of single logged tree fall, a survey was performed in 54 gaps formed by the felling of single trees. Characteristics of the single harvested tree were recorded and included species, DBH, commercial height, total height, and canopy proportions. Damage to all surrounding trees was recorded. Gap-trees damaged were assigned to one of nine classes based on the severity of damage. Damage to trees in the gaps varied from a slight bump (I) or minor to severe bark loss (II and III), to minor to severe canopy damage (IV–VII), to more acute damage including severing of the trunk (VIII) and crushing the entire tree to the ground (IX). "Total_stems_damaged_gap" report the total number of trees in all nine classes. The field "Stems_severed_smashed_gap" reports trees in classes VIII and IX (Feldpausch et al., 2005). Gaps were defined as the actual projected canopy and gap area was measured using the center point system (Runkle 1982) based on the summation of the area of six triangles using the distance from the center of the gap to the edge to define the triangles. Of the 1,031 measured damaged trees (>10 cm DBH), nearly 50% either had the trunk severed or were crushed to the ground, which is equivalent to 5 trees severed at the trunk and 5 trees crushed to the ground for every tree logged. Damage in these two classes results in tree mortality in the absence of stump or stem coppicing. Figure 3. Locations of logging roads, log decks, and commercial timber in Blocks 5 (a) and 18 (b). Feldpausch, T.R., S. Jirka, C.A.M. Passos, F. Jasper, and S.J. Riha. 2005. When big trees fall: Damage and carbon export by reduced impact logging in southern Amazonia. Forest Ecology and Management 219(2-3):199-215. Runkle, J.R. 1982. 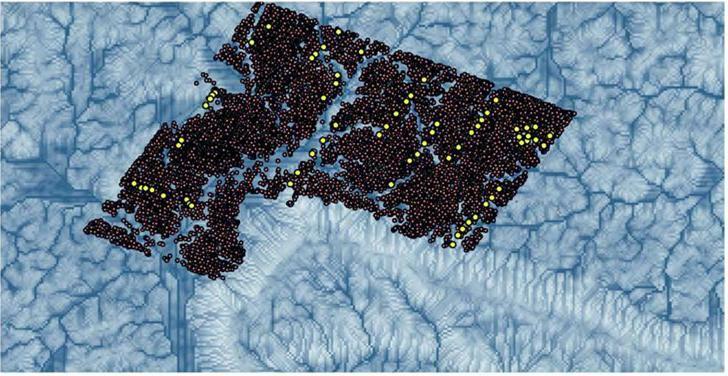 Patterns of disturbance in some old-growth mesic forest of eastern North America. Ecology 63: 1533-1541.